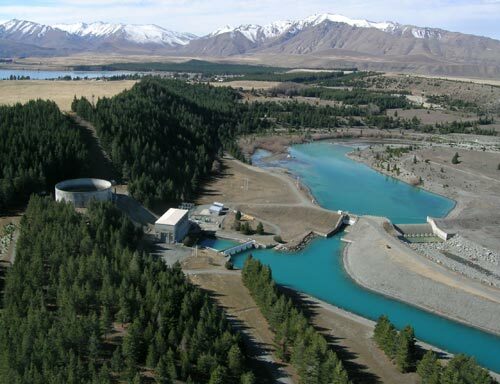 Hydro generation at Lake Tekapo with the Tekapo A and Tekapo B power stations. Construction began on the Tekapo power station in 1938 and should have been completed in 1943, but the construction process was stopped as man power was diverted to the war effort of World War II. The control gates (dam) were built across the outlet of Lake Tekapo in 1940 and were used to regulate the amount of water entering the Tekapo River which contributes the Waitaki River and passes through the Waitaki power station in the lower reaches of the river. A 1.6km intake tunnel was constructed through the ancient glacial moraine to supply water from the lake to the power station. The lake was later raised to its current maximum level to provide a storage capability. The power station was finally commissioned in 1951 and became the second power station in the now substantial Waitaki power scheme. Water stored behind Lake Tekapo's 12 metre high dam is drawn through the intake on the shores of the lake. 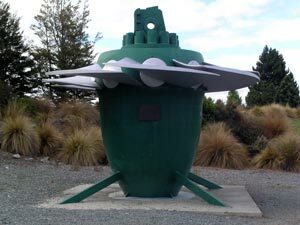 It is delivered to the power station through the 1.6km tunnel running through a small hill above the Tekapo village. The speed and huge volume of water provides sufficient energy, as it flows through the power station's turbine, to begin rotating it at high speed. The rotating turbine is connected to an electrical generator that converts the rotations into electrical energy. A network of power lines, referred to as 'the main grid' delivers the electricity to businesses and homes. The generator in the Tekapo-A power station is capable of supplying up to 25,200,000 watts (25.2MW) of electricity. That's sufficient energy to drive 12,600 2kW heaters. 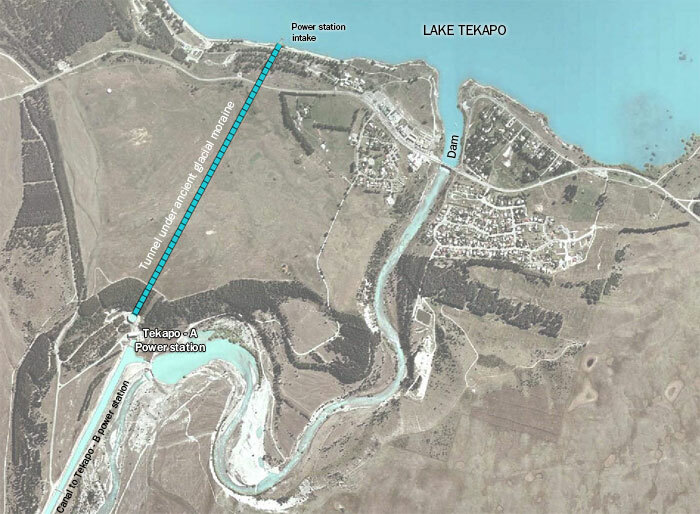 During maintenance periods at the power station, Tekapo's water can bypass the power station by being released through the control gates on the Tekapo River. The water follows the normally dry riverbed a short distance to a small weir at the power station called Lake George Scott. From this weir the water can either be diverted into the canal on the output of the power station to continue its journey to the Tekapo-B power station, or the water can bypass two hydro lakes and four power stations in the Upper Waitaki by continuing down the lower Tekapo River to the man-made Lake Benmore. Either route flows into Lake Benmore and from there the water passes through the Benmore, Aviemore and Waitaki power stations before finally completing its journey to the sea. In periods of heavy rainfall, excess water can be released from the lake through the control gates and then spilled over the slipway at Lake George Scott into the lower Tekapo River and down to Lake Benmore. Initially funded by Genesis Energy's predecessor, ElectroCorp New Zealand (ECNZ), construction began on the current 500 metre long kayak slalom course back in 1998. The kayaking course can operate at variable levels of difficulty due to the control over the water flow through the course. 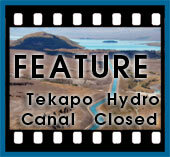 Through the combination of the control gates across the outlet of Lake Tekapo and by a smaller control gate at the beginning of the course, water can quickly be introduced or restricted from the artificial stretch of riverbed. The course is rated as Grade II to II+ with a water flow of 10 to 15 cumecs (cubic metres of water per second) and Grade III at 20 to 25 cumecs. 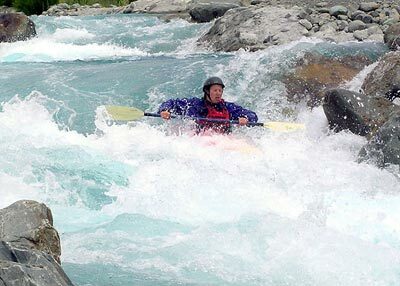 Genesis Energy makes up to 15 recreational or environmental releases of water (of up to 60 cumecs) down the Tekapo Whitewater Course or the Tekapo River each year between October and April. See our events page for operating dates of the White water kayak course. Fishing is popular on the man made water ways of Genesis Energy's canals. The constant flow of oxygen rich canal water has produced some good sized, healthy brown and rainbow trout. Mt Cook Salmon operates a fresh water salmon farm within the Tekapo B canal that delivers water exiting the Tekapo-A power station, across the Mackenzie Basin, to the Tekapo B power station at Lake Pukaki. The constant flow of quality alpine water ensures a healthy environment for the farm. Any risk of disease is minimised or completely removed by the fact the water is renewed each minute, never to return again. It is alleged a number of huge trout have been caught near the salmon farm, their size a result of scavenging the feed that drops through the cages of the farm.